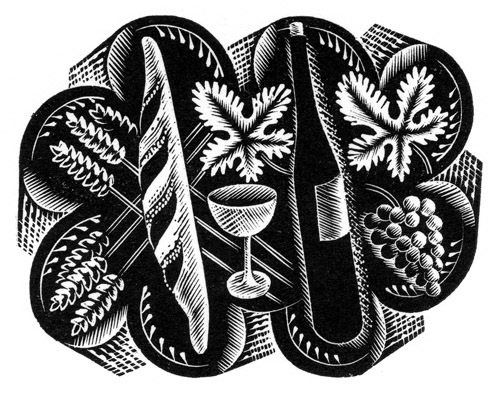 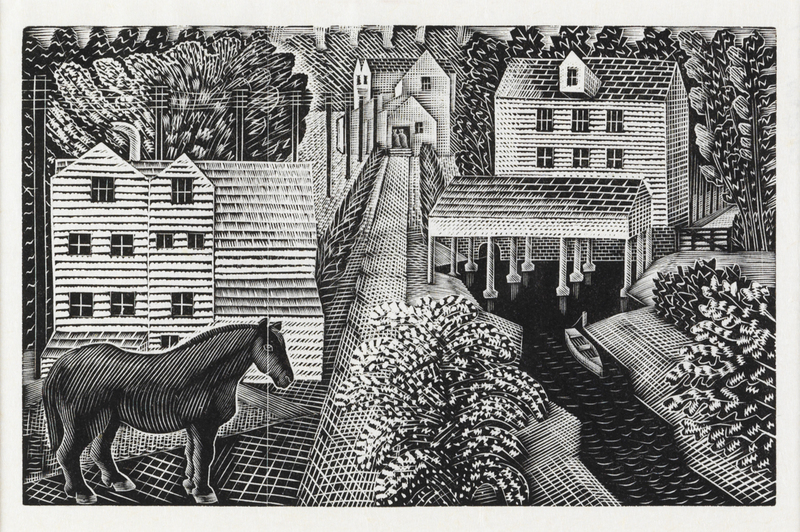 Eric Ravilious (1903 – 1942) was an English painter, wood-engraver and designer. 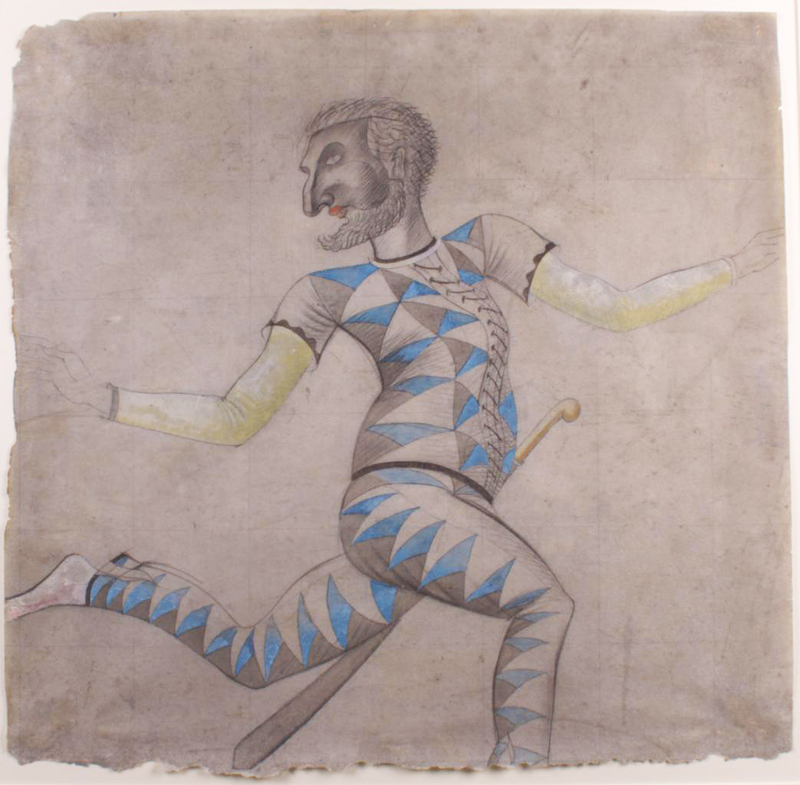 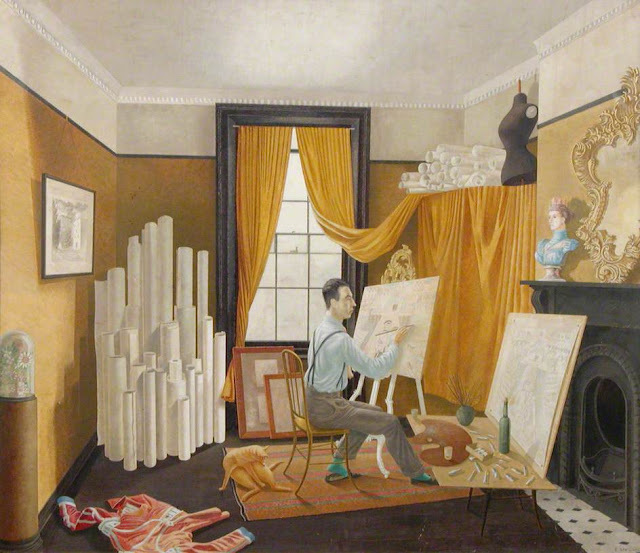 He was educated at Eastbourne School of Art and then at the Royal College of Art (1922–5), where he was taught by Paul Nash and became close friends with Edward Bawden. His early works included the refectory mural (destr. 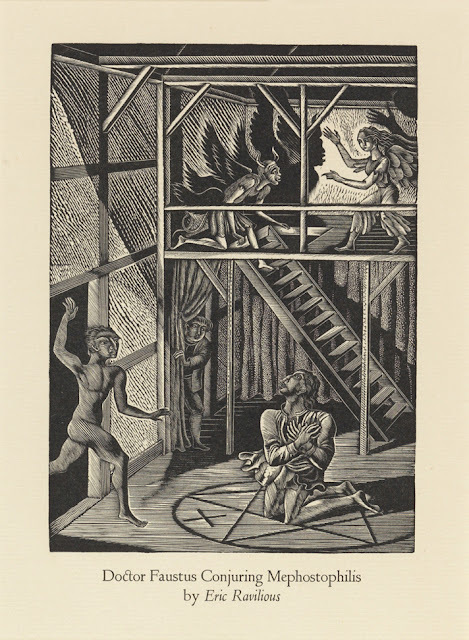 1940) in Morley College, London, and wood engravings in the tradition of Bewick for the Golden Cockerel, Curwen and Nonesuch presses. 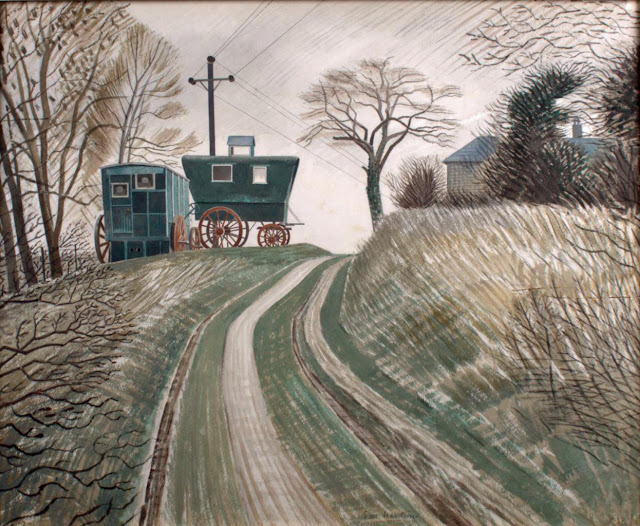 In the 1930s he began painting larger compositions in a wider range of colour, and this led him to use lithography. 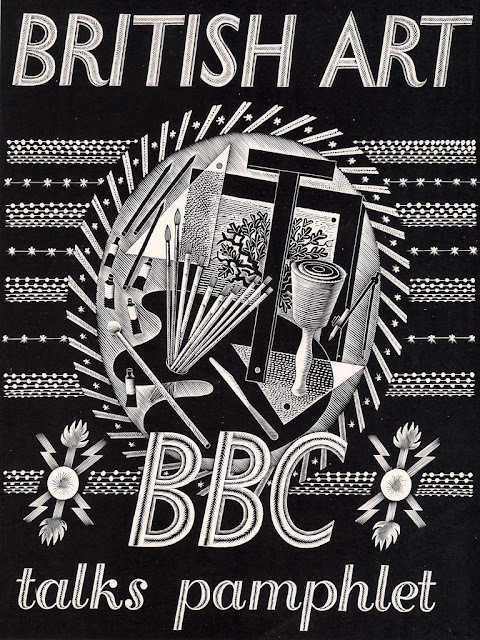 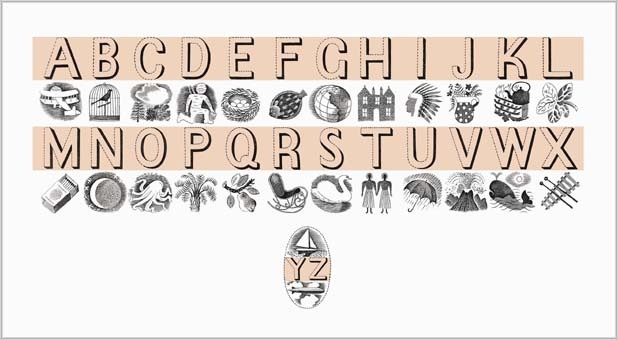 Ravilious also produced designs for Wedgwood, including the celebration mug (1936) for the coronation of King Edward VIII, which was withdrawn and revised for the coronations of George VI and Elizabeth II; the Alphabet mug (1937); the Afternoon Tea (1937), Travel (1938) and Garden Implements (1939) china sets; and the Boat Race Day cup (1938). 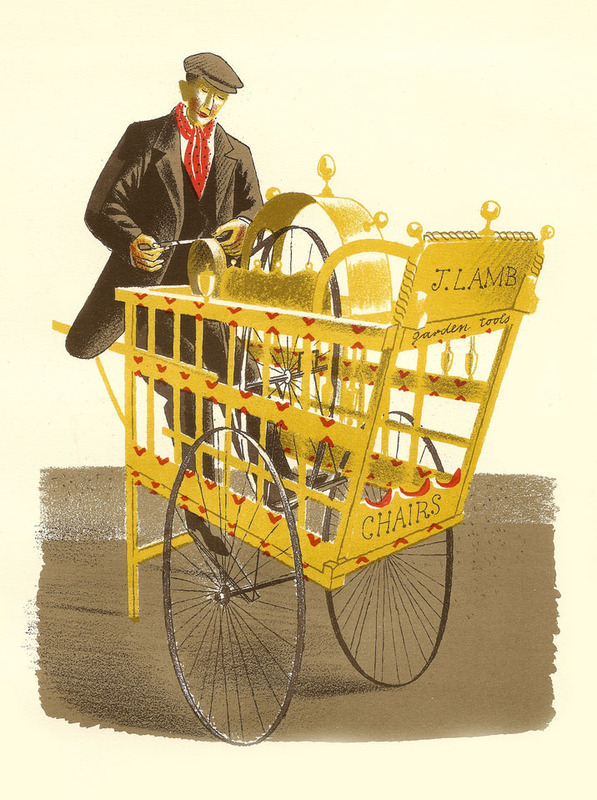 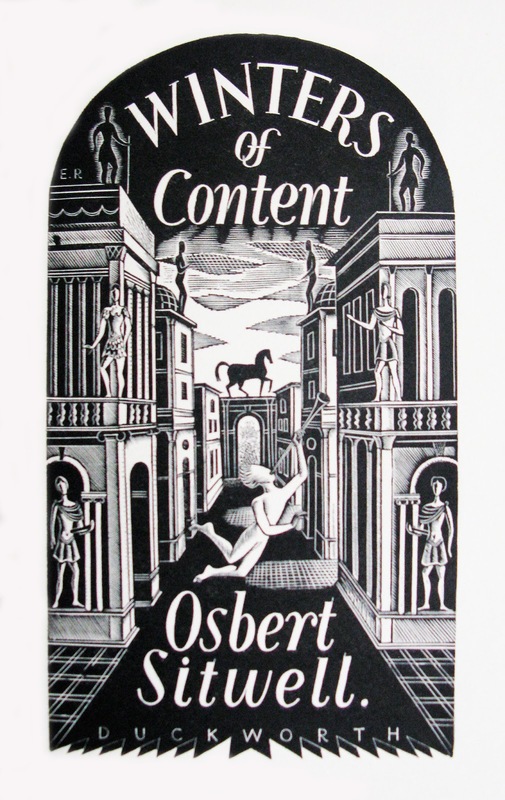 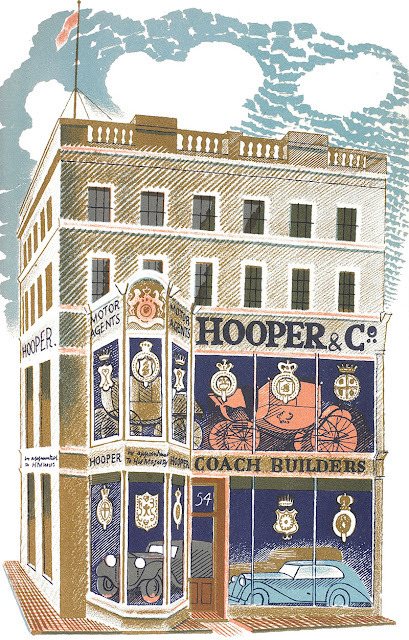 He also designed glass for Stuart Crystal (1934), furniture for Dunbar Hay (1936) and graphic work for advertisements for London Transport and others. 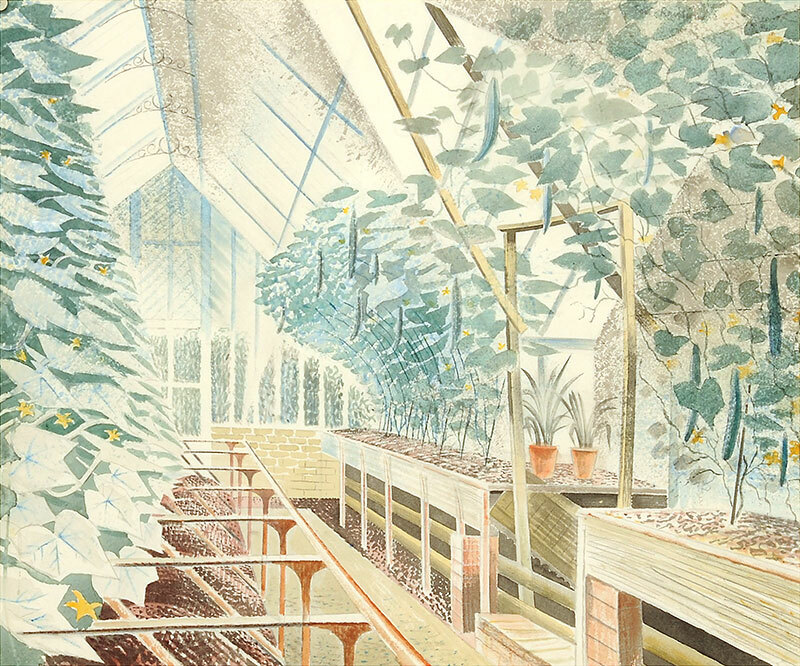 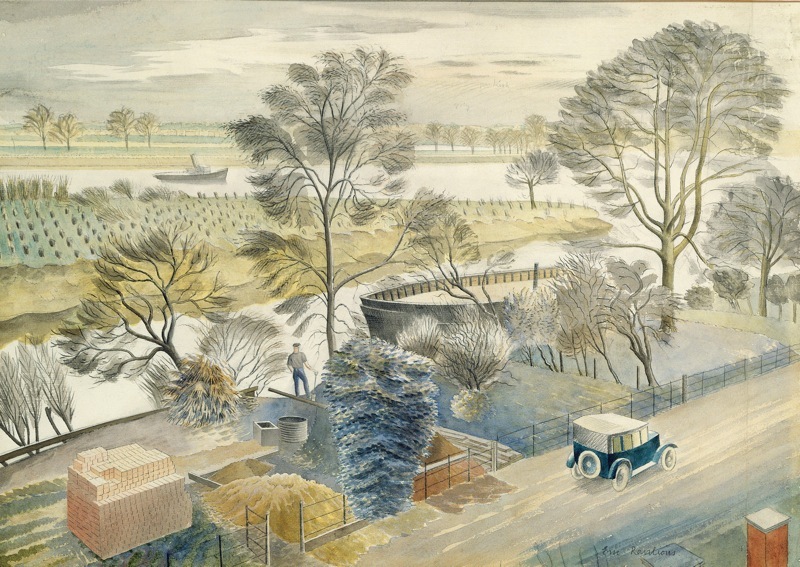 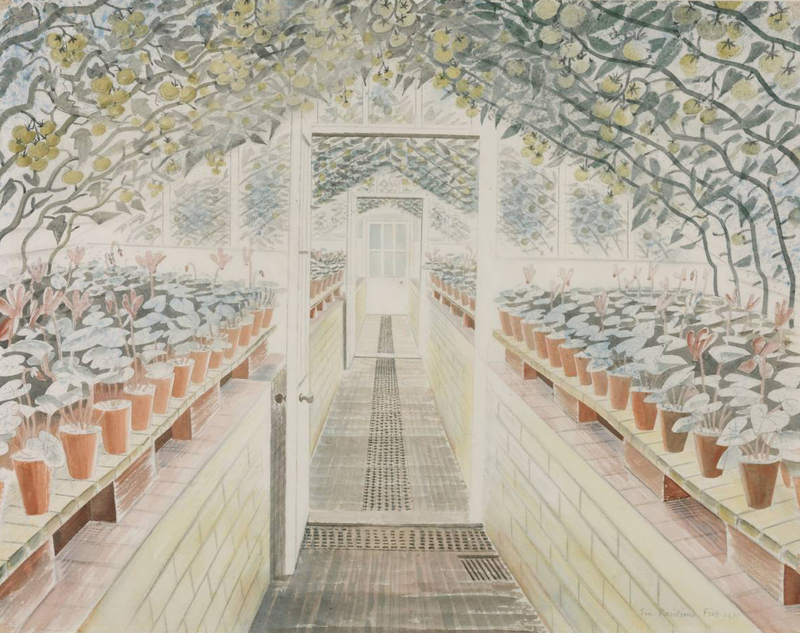 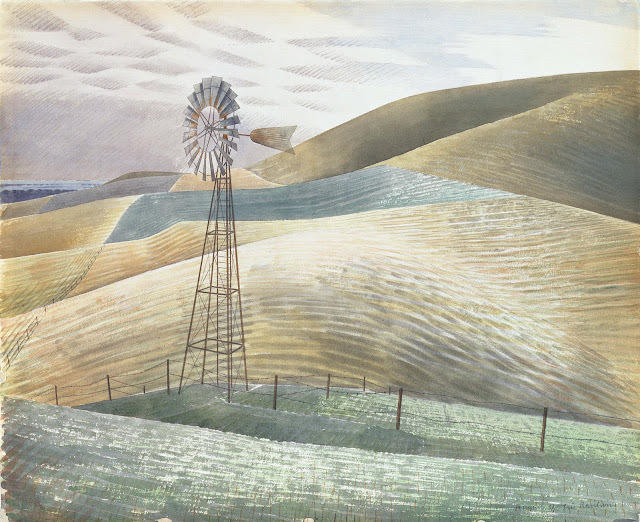 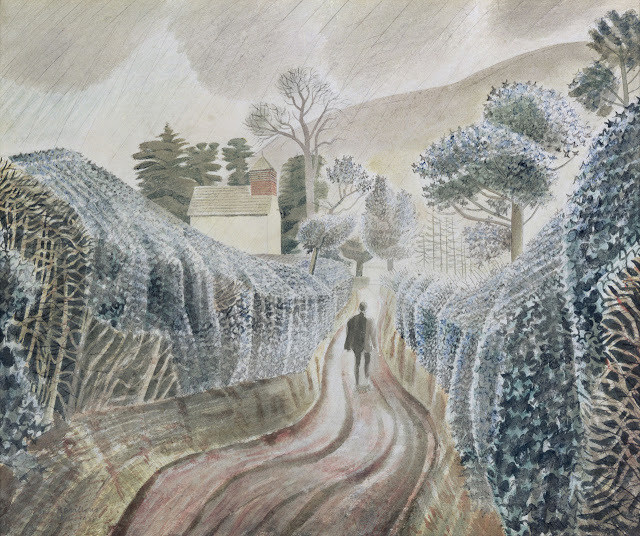 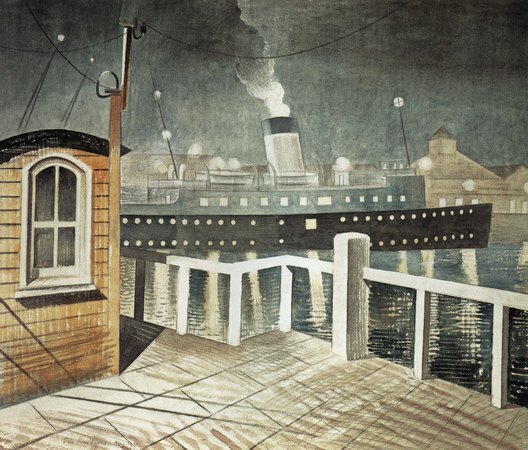 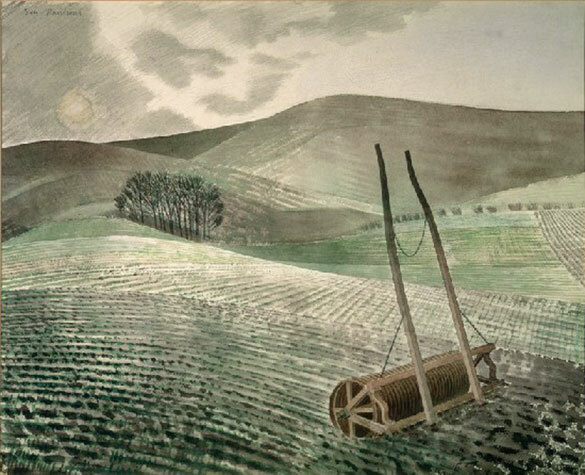 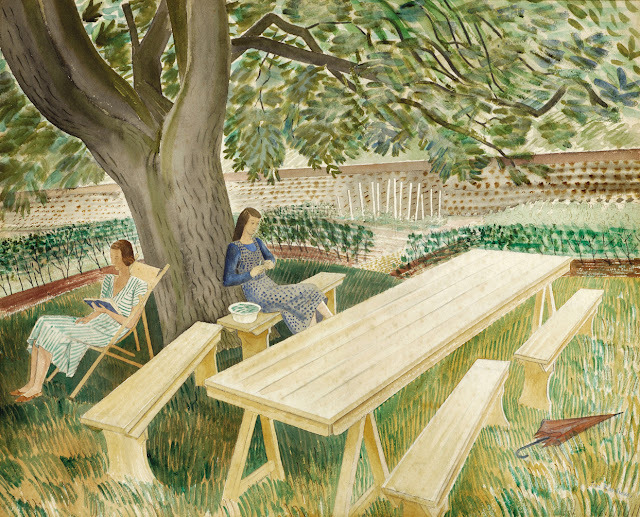 Despite his success as a designer, Ravilious concentrated increasingly on watercolours. 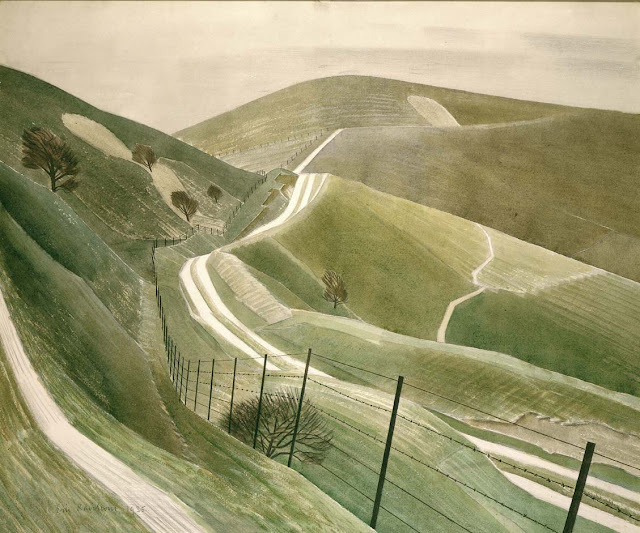 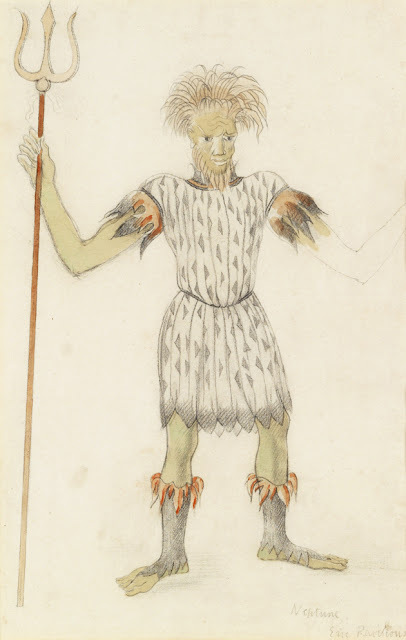 His landscapes and rural interiors often featured the downland and coast of southern England; haunting and lyrical, these works show a world in suspense and often feature chalk hill figures, and empty rooms (e.g. 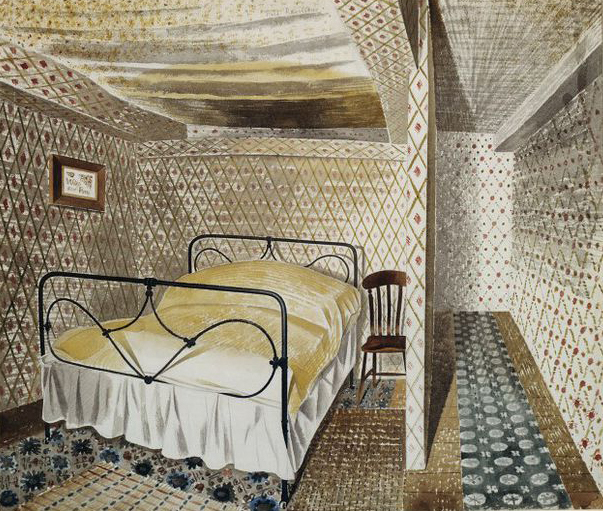 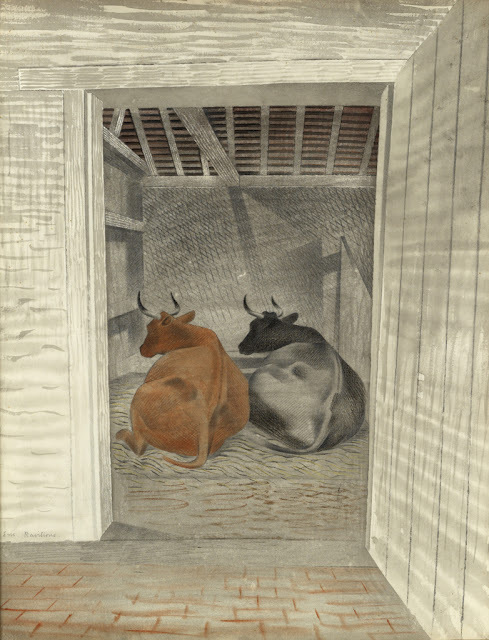 Farmhouse Bedroom, 1939; London, V&A). In 1939 Ravilious became a War Artist. He died in 1942 while observing a sea rescue mission. 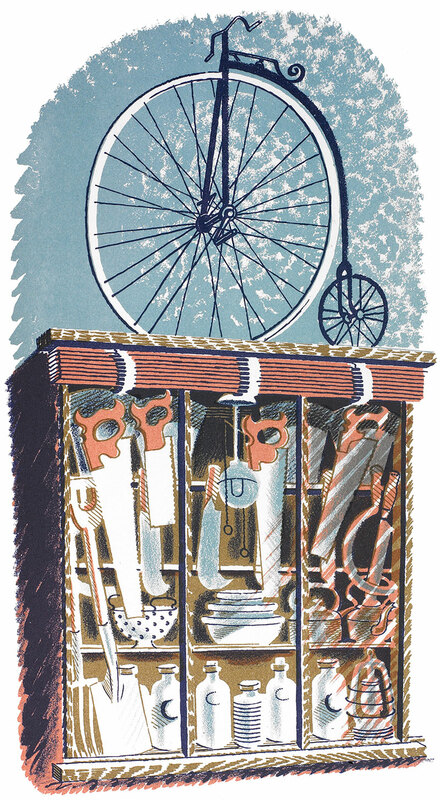 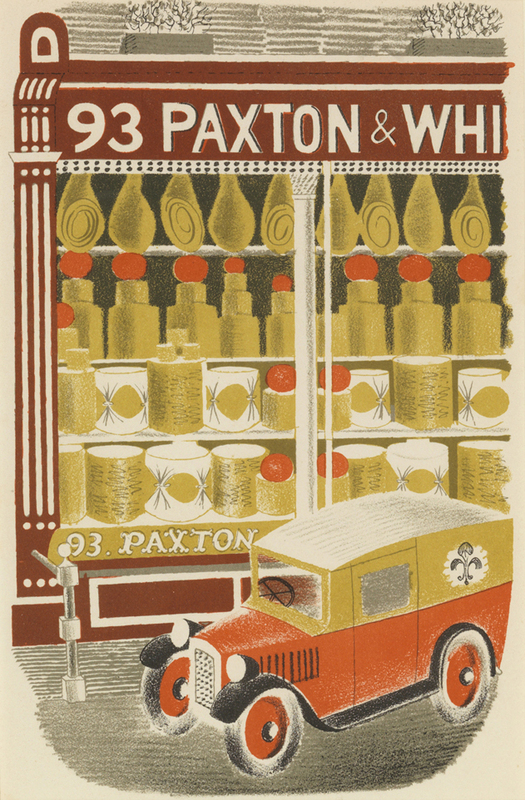 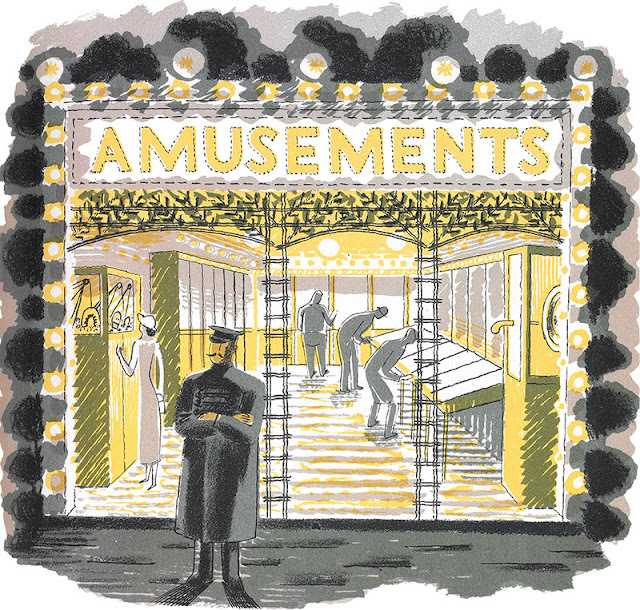 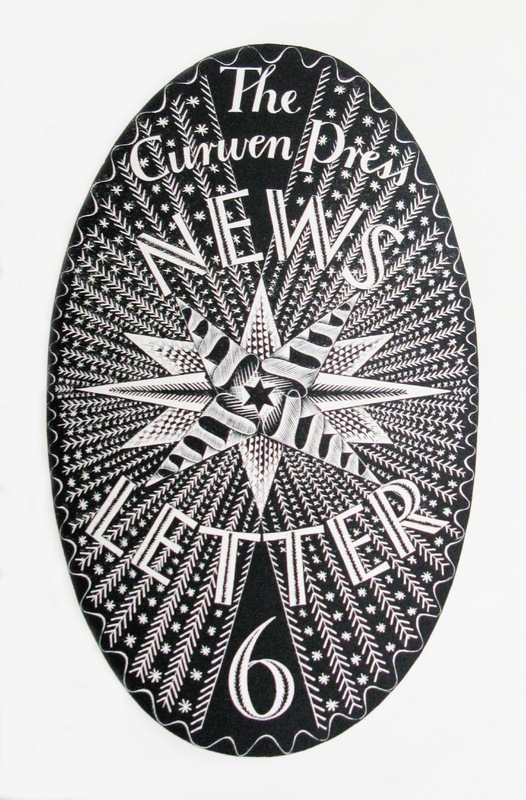 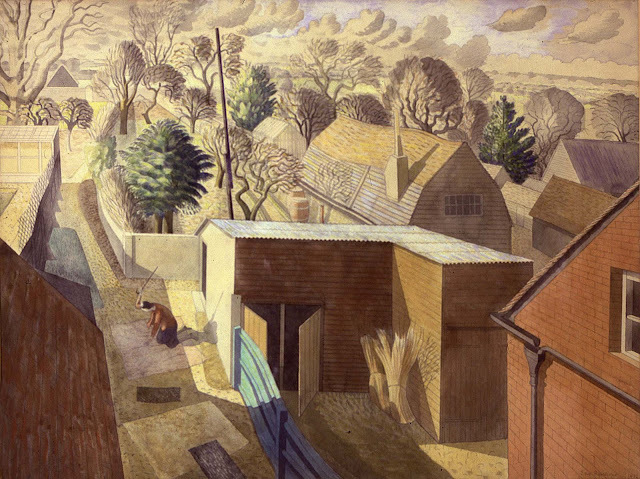 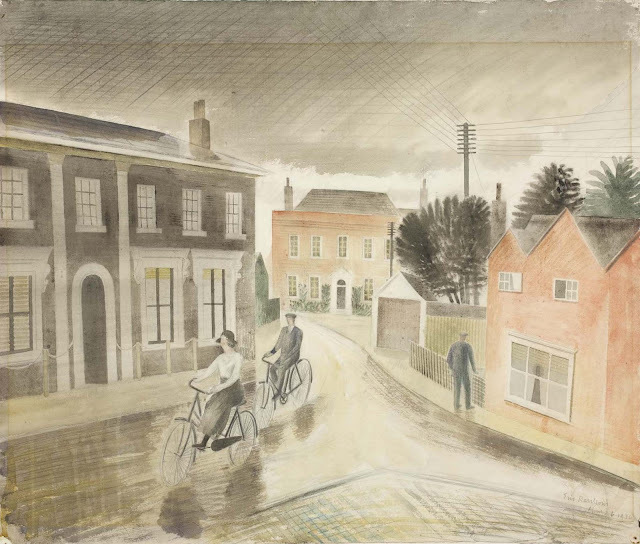 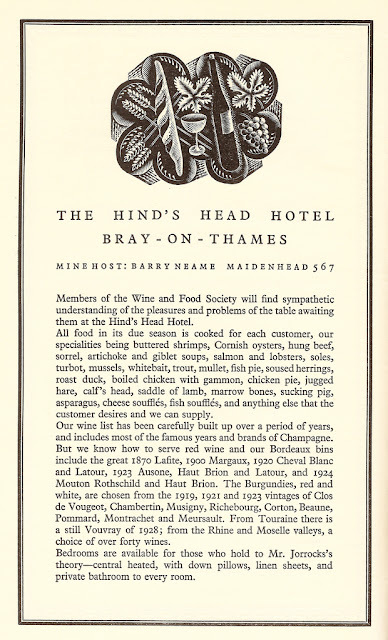 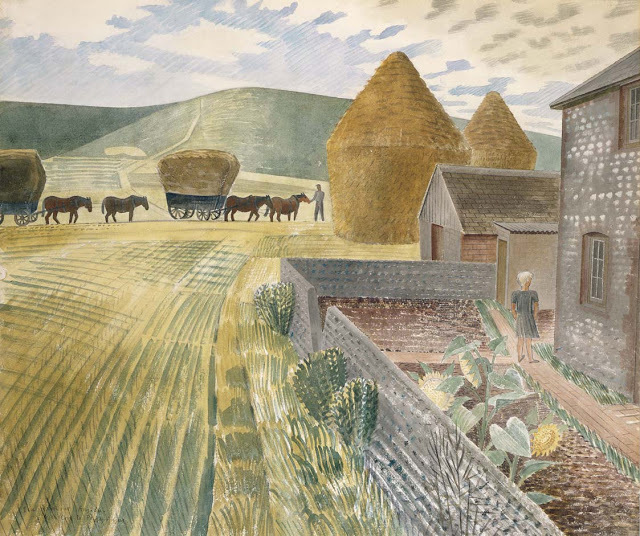 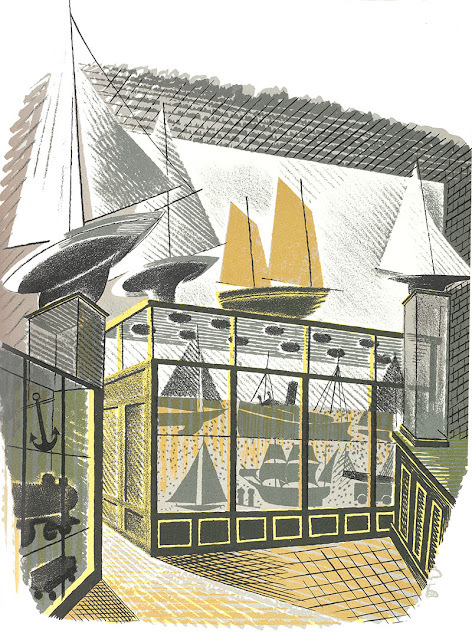 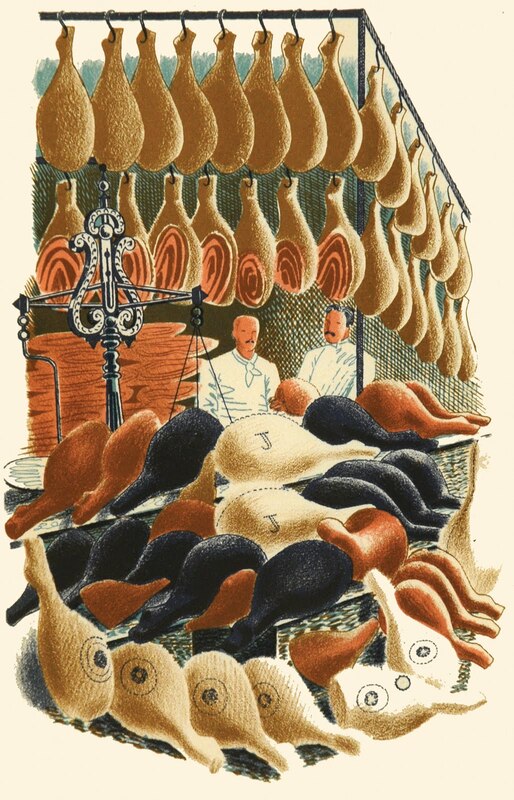 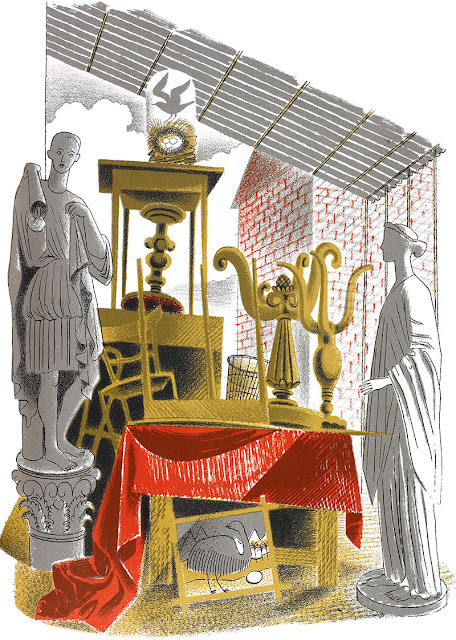 This is part 1 of a 3-part post on the works of Eric Ravilious. 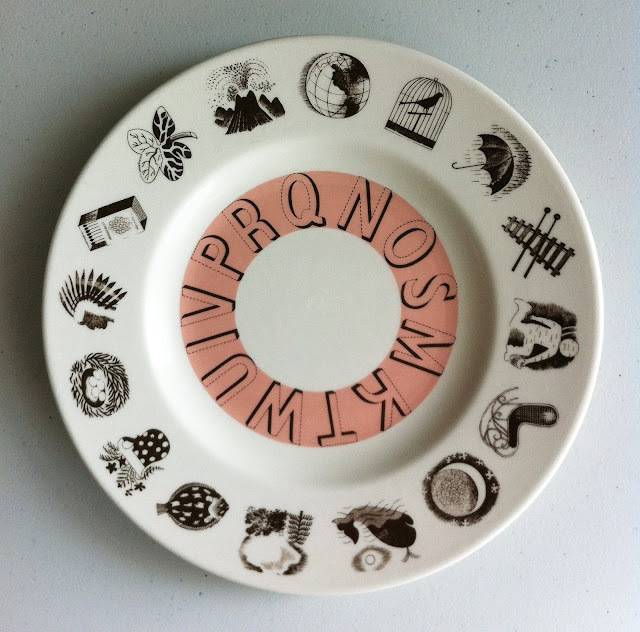 Parts 1-2 show a chronology of his works other than ceramic designs – part 3 will show ceramic designs. 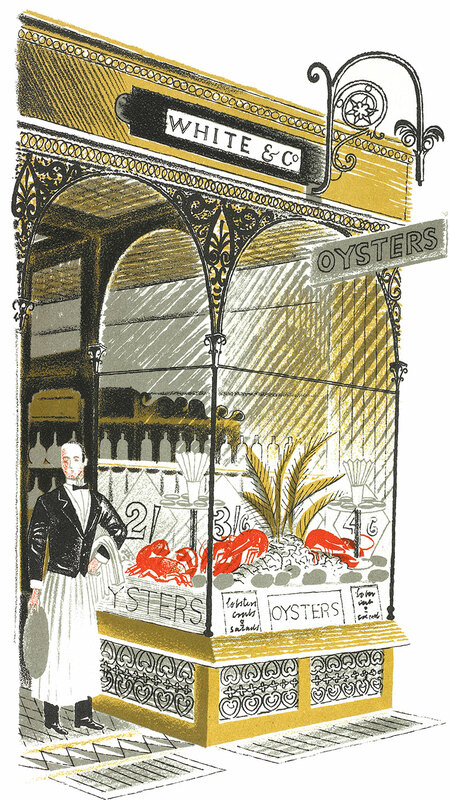 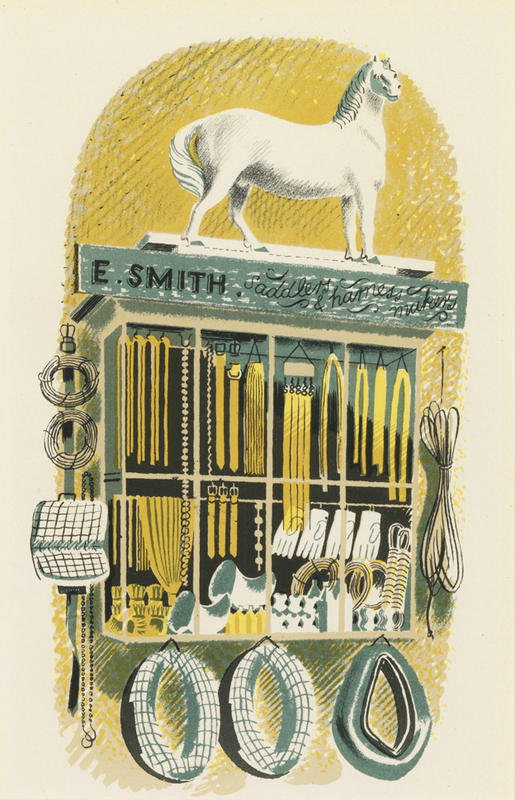 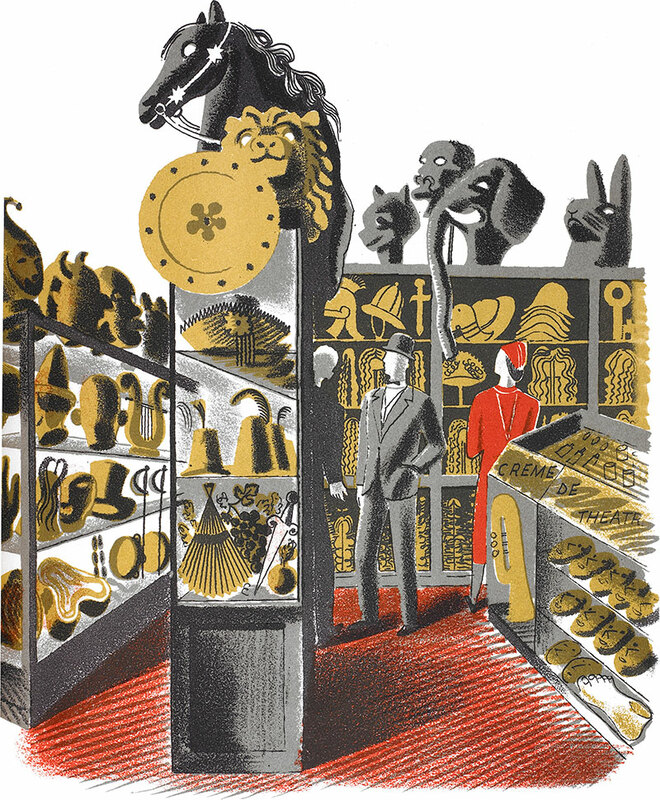 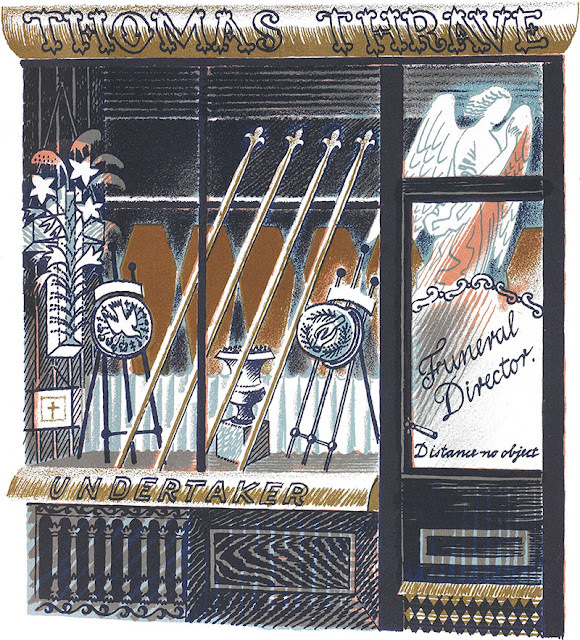 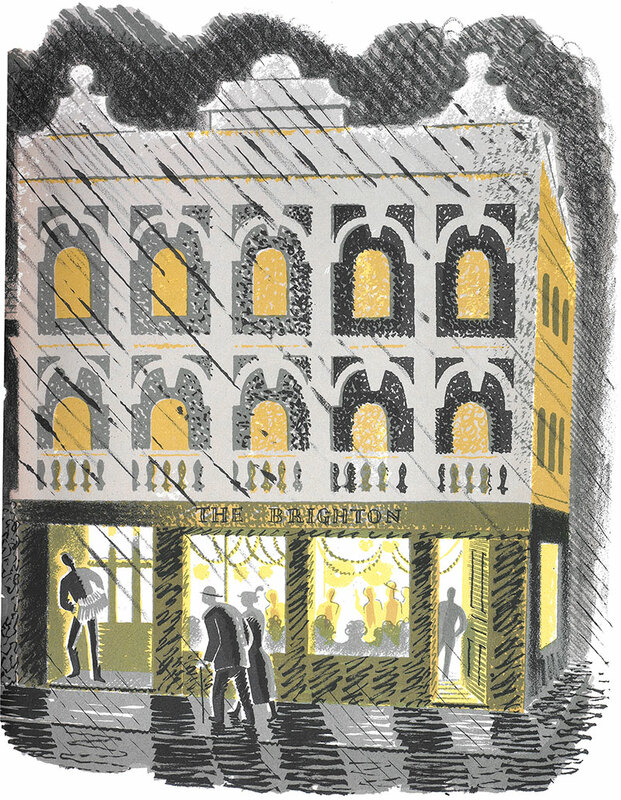 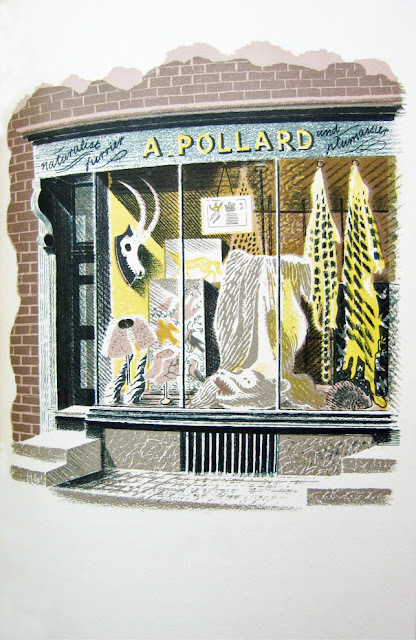 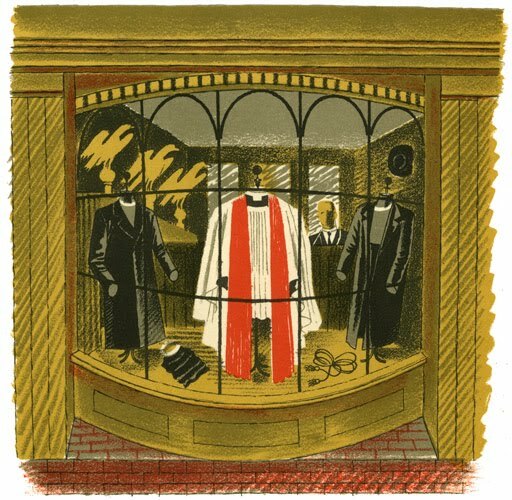 In 1938 Ravilious created a set of 24 lithographs of shops, which were found on the British High Street of that time, for Country Life books. 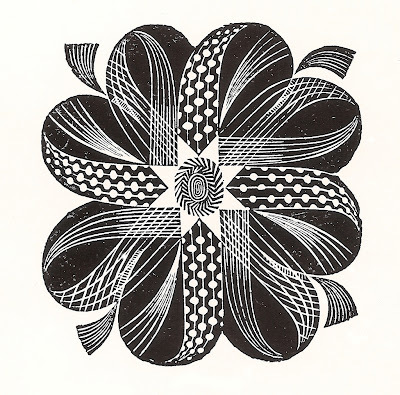 These prints formed a book for children printed by the Curwen Press. 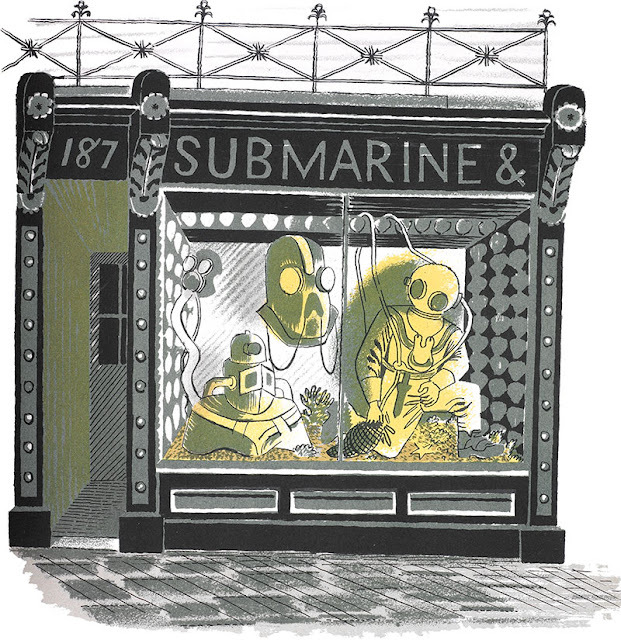 Unfortunately, only 2000 books were printed because it’s printing plates were destroyed during the blitz but as a result High Street has become one of the most highly sought after artists books of the time. 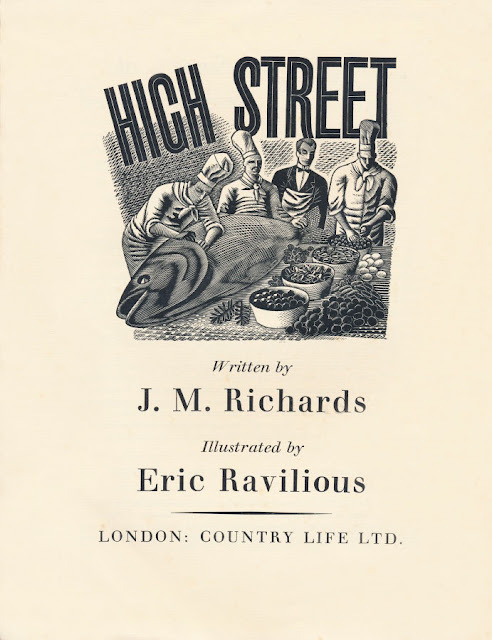 1938 Cover of "High Street"
1938 Title page of "High Street"
1938 A Saddler and Harness Maker from "High Street"
1938 Amusement Arcade from "High Street"
1938 Cheesemonger from "High Street"
1938 Clerical Outfitter from "High Street"
1938 Coach Builder from "High Street"
1938 Family Butcher from "High Street"
1938 Fireworks from "High Street"
1938 Grill Room and Restaurant from "High Street"
1938 Hams from "High Street"
1938 Hardware from "High Street"
1938 Knife Grinder from "High Street"
1938 Letter Maker from "High Street"
1938 Model Ships and Railways from "High Street"
1938 Oyster Bar from "High Street"
1938 Public House from "High Street"
1938 Second-Hand Furniture from "High Street"
1938 Submarine Engineer from "High Street"
1938 The Furrier from "High Street"
1938 Theatrical Properties from "High Street"
1938 Undertaker from "High Street"
Thanks so much for this. 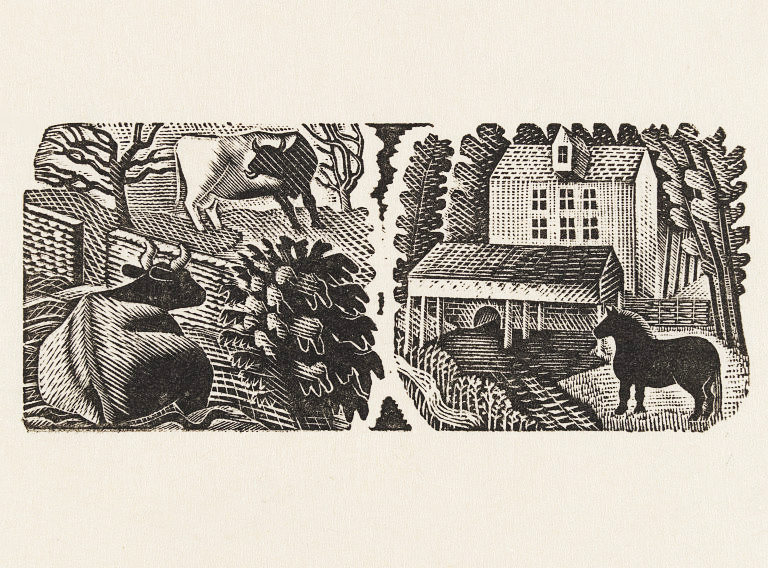 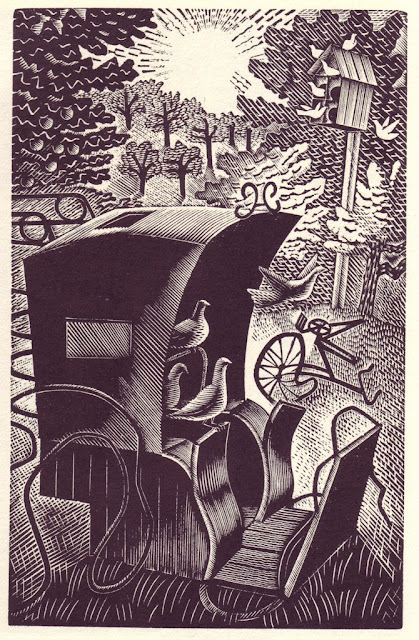 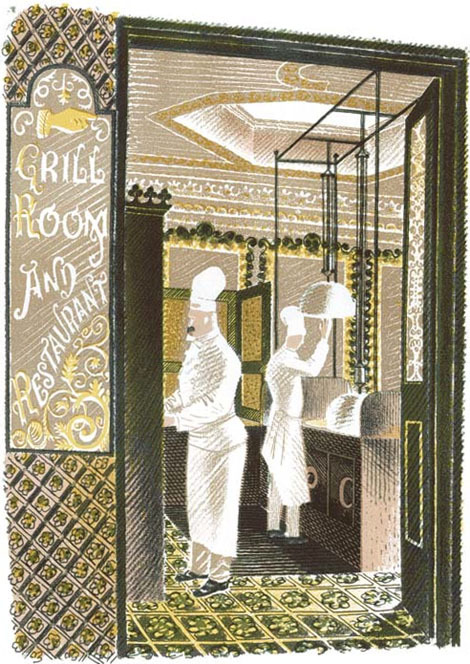 I'd forgotten how much I loved the work of Ravilious, one of the great English illustrators and designers. 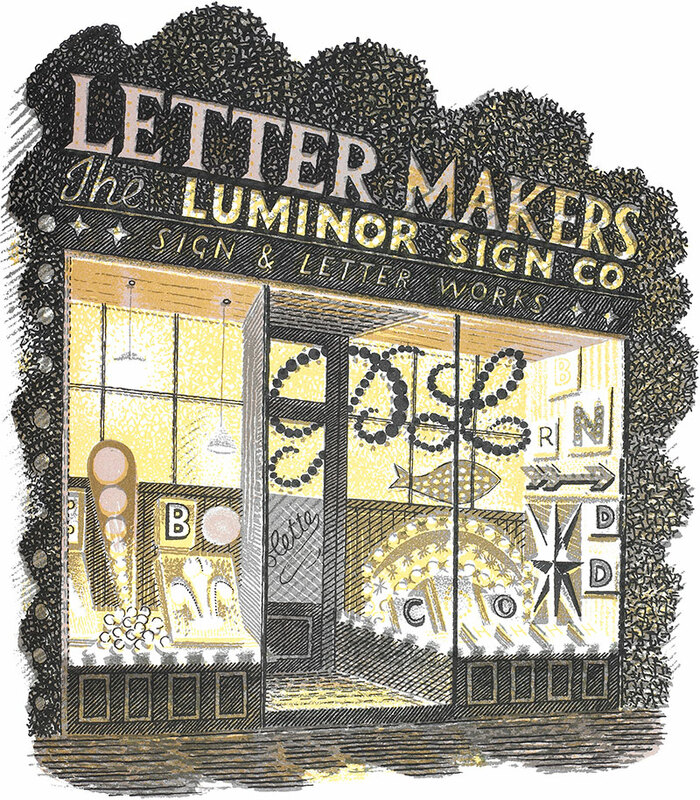 I'm a big fan of your site and this is the icing on the cake. Thanks! 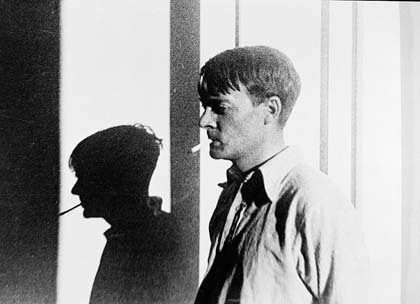 Thank you John. 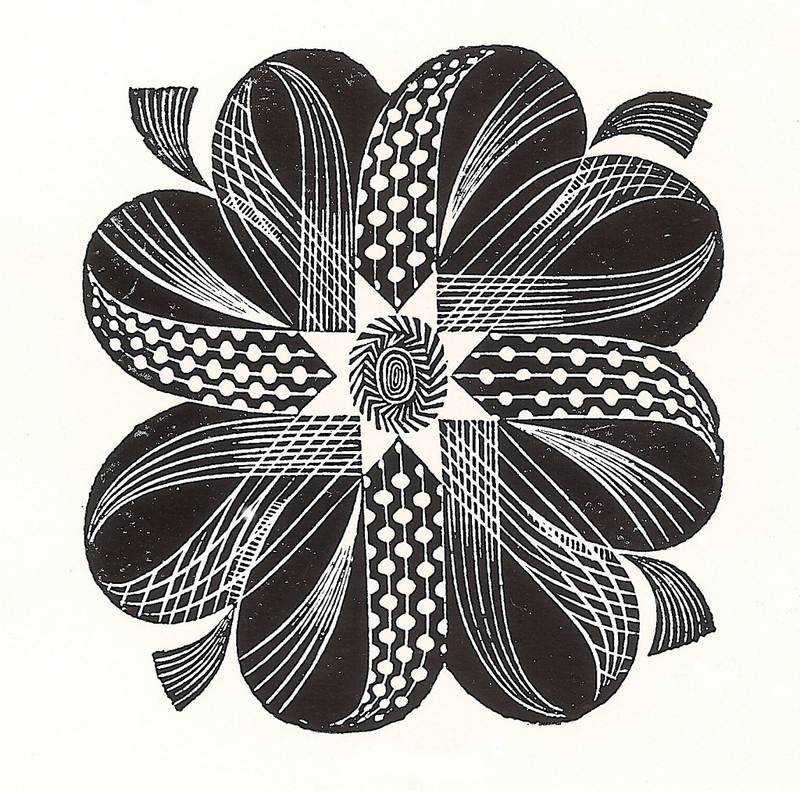 Comments much appreciated. 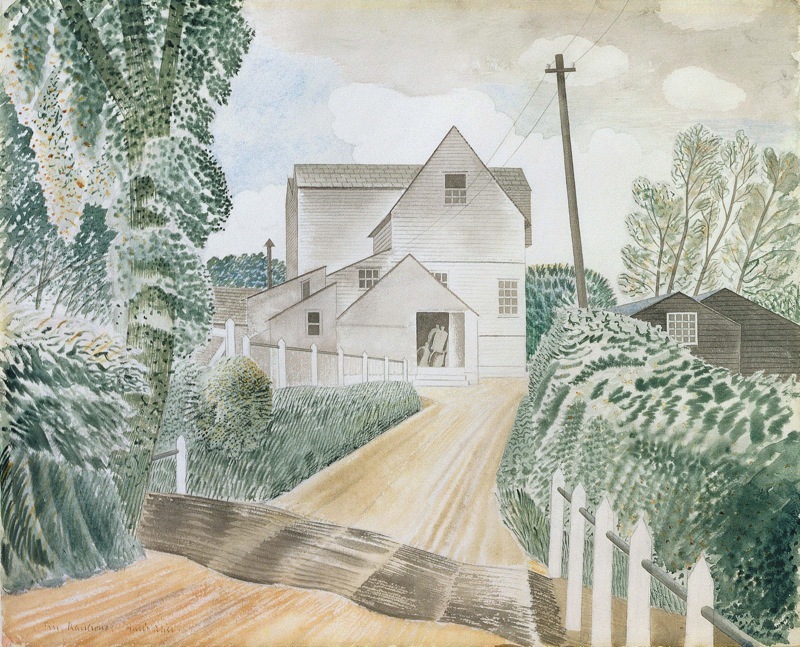 I went to the Pallant House Gallery yesterday to see the Ravilious prints. 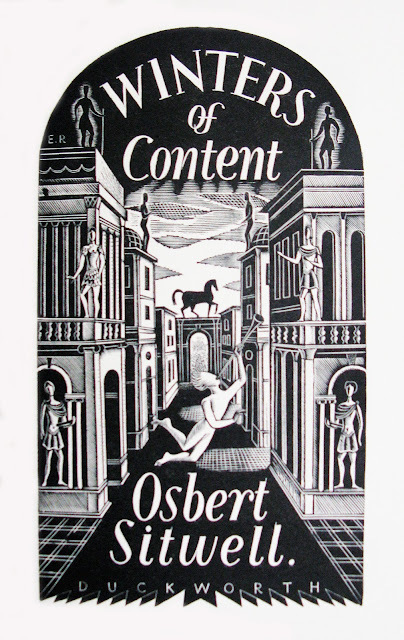 This is a fantastic little supplement to that. 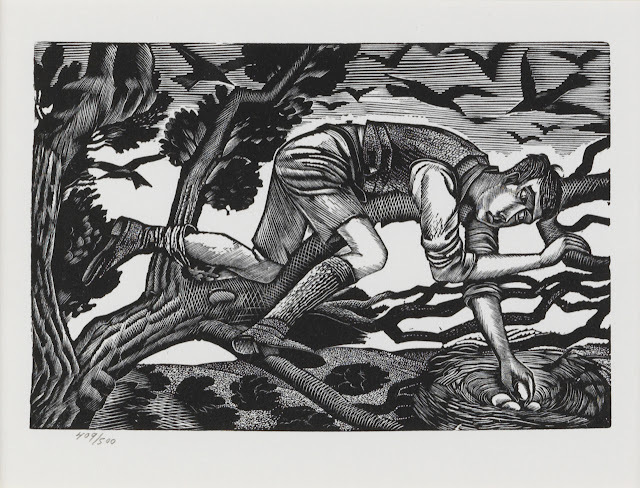 He was such a great print maker. 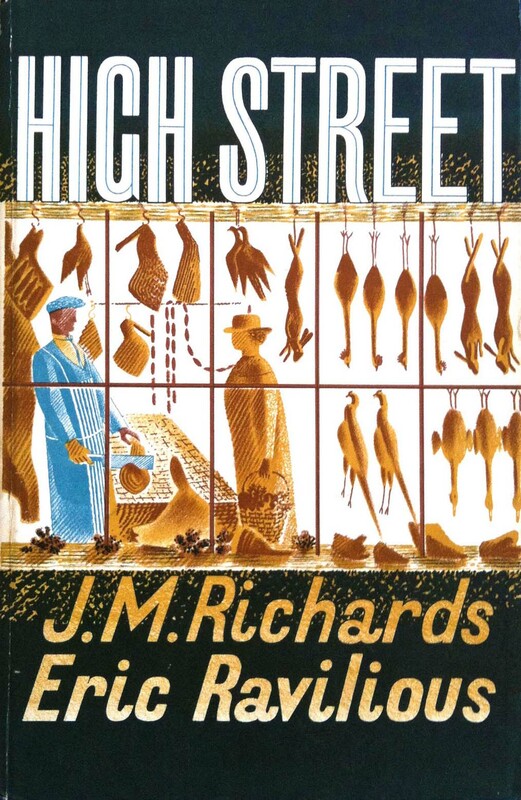 The High Street series is quite fabulous.